You can teach an old dog new tricks and a new dog old tricks. You can even teach a hound dog to cry all the time. 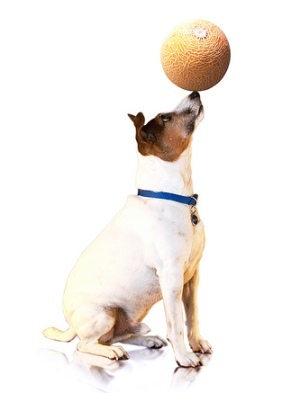 All it takes is time, treats, patience and some cool tricks to teach your dog. Dogs love to please and learning cool tricks is just as much fun for them as doing them for you later. And a performing dog can be a great partner for meeting new friends at the dog park. Just remember to keep repeating the tricks and rewarding your dog with treats and praise until it learns. Another easy trick. 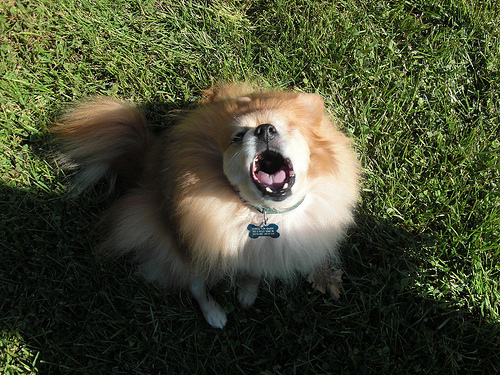 Every time your dog yawns, say “Are you sleepy?” Do it every time and eventually the dog will yawn on command. 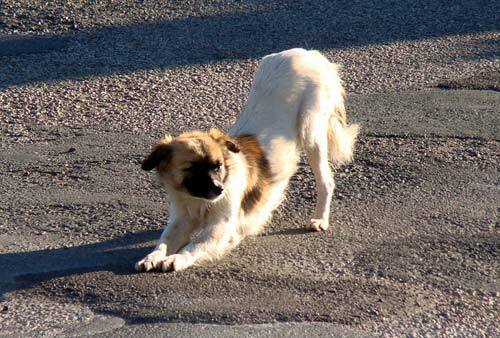 With your dog in a standing position, kneel in front and place your left hand under the dog’s stomach. With a treat in the other hand, coax the dog to put its nose to the ground while you say “Bow.” Keep the dog from lying down with your left hand and give the treat when it finishes the bow. 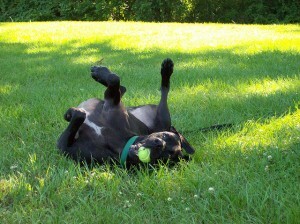 While on a carpet or grass, get your dog into the down position. 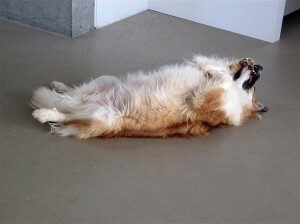 Kneel on one side and gently roll the dog over while saying “Roll over.” When the dog finishes rolling, give the treat. This is a great trick for younger dogs but give seniors with bad backs a break and just give them the treat. This old favorite is easier to teach if your dog has been exercised and is ready to rest. Command your dog to go down and watch which side it leans to. Gently push the dog over on that side as you say “Play dead.” Praise and rub its tummy and use the “stay” command to keep it there. Repeat until you don’t have to push. With your dog in the “lay” position, hold a treat in front of its nose and then move it a few inches away while saying “Crawl.” If the dog crawls, give it praise and the treat. If it stands up, say “No, crawl” and go back to the lay position and repeat. Slowly lengthen the crawl length before the praise and treat. With a treat in your hand, say “Pick” while your dog smells and even tastes the treat. With the other hand, lift the dog’s paw and touch it to the hand with the treat. Give the dog praise and the treat. Once it learns with one hand, present both hands (one empty) and say “Pick.” Say “Uh-oh” and open the empty hand if the dog picks it, praise and the treat if it picks the right one. 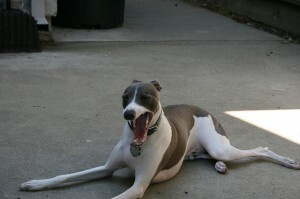 This is a fun one to have your dog do when your friends do something embarrassing. With a treat in your hand and the dog in the down position, gently blow on its nose. 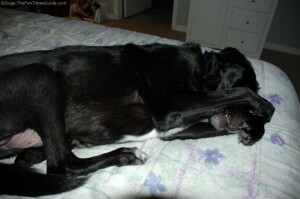 When the dog covers its eyes with a paw, say “Peek-a-boo” and give the treat. You can also lift the paw of a reluctant learner. With a few treats in each hand and your hands behind your back, begin with your dog facing you. Put your right hand behind your right leg and coax the dog to follow it through your legs and around to the right while saying “Weave.” Put your left hand behind your left leg, coax the dog through your legs again and to the left while saying “Weave.” Reward and repeat. 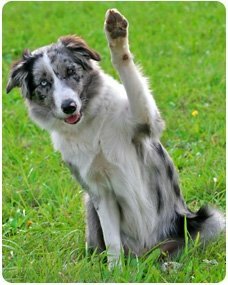 As your dog learns, move your hands higher and stand up straighter. Place a little peanut butter on the handle of an open door. Say “Close the door” as your dog licks it off and give another treat. Repeat a few times, then gently push the dog’s nose against the door so it moves. Praise and reward. After a few successful tries, use a little more pressure to help the dog push the door closed while saying “Close the door.” Praise, reward and repeat until the peanut butter is no longer needed.